The third annual Rumson St. Patrick’s Day Parade commences this Sunday afternoon, March 8, capping a season of celebrations that extend into the week to come. Those minty Shamrock Shakes may come and go, but Celtic culture on the greater Red Bank Green is a year-round affair that traces a path through Irish Tenor concerts and Riverdances; Green Christmases and the appearance of Guinness Oysterfest in September. That said, the recently minted flagship fleadh of the calendar year has got to be the Rumson St. Patricks Day Parade, the third annual edition of which commences this Sunday. A Menna Administration official and a Republican council candidate clashed at Sunday’s Red Bank Halloween Parade over campaign balloons. GOP contender Linda Schwabenbauer said she believed she was exercising a First Amendment right and had borough authorization when she gave away about 200 balloons bearing her name and that of running mate Sean Di Somma to children and adults before the start of the parade. But Parks and Recrecreation department director Memone Crystian told her to stop, threatening to call the police if she continued, she said. Administration officials dispute the claim that they’d OK’d a balloon distribution, and contend they have the law on their side in asking Schwabenbauer to stop. Autumn delivered a gorgeous day and the marchers brought their best scary, funny and pretty faces to Sunday’s annual Red Bank Halloween Parade. The first-ever Rumson St. Patricks Day Parade drew 10,000 Irish eyes  as estimated by Mayor John Ekdahl  to East River Road Saturday as throngs of borough residents threw on a little green, embraced their inner Celts and celebrated their verdant town. A plethora of princesses mingled with cowpokes, cartoon characters and creepy creatures of the night at the sixty-fifth annual Red Bank Halloween Parade Sunday. redbankgreen‘s Rebecca Desfosse was there to capture some of the color and charm. Bill Normyle leads a Red Bank Ghost Tour in 2010. See below for details of the current edition. October is the time for womens awareness issues; breast cancer and domestic violence share the month. At 180 Turning Lives Around, volunteers hope to give purple its due in the midst of so much pink. Purple is the color that signifies the bruises and shame that come from abuse inflicted by someone that you love and trust, said Barbara Lovell-Napoli, assistant director of development at 180. Monmouth County has the second-highest incidence of domestic violence in New Jersey, Lovell-Napoli said, and the most effective tool for prevention is awareness. Each year, former clients put on a gallery show based on 180’s art therapy program. For 2012, its called Heads Up! and opens tonight at U Gallery. On display through October 24 a will be artwork from survivors and artists who support 180s mission. Get your costumes ready for Red Banks annual Halloween Parade, now in its sixty-fifth year. Set for this Sunday, the parade, hosted by the borough Parks and Rec department, will include costume- and float-judging, with prizes to be awarded. Last year, the folks from the Red Bank Charter School built a barn and silo for float. That will be hard to top. A rather large spider that anchored its web to a lamppost on Broad Street in Red Bank Thursday triggered discussion among passersby about an apparent proliferation of large arachnids this season. 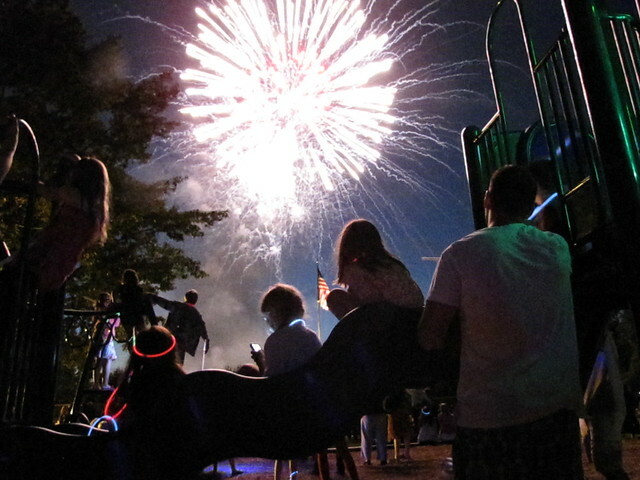 On a perfect summer day, Fair Haven celebrated its first century as an independent borough in classic American style Saturday: with a parade, a townwide picnic, and a breathtaking fireworks show that capped it all off in electrifying color and sound. “Eat your heart out, Red Bank,” one man shouted during the finale at Fair Haven Fields. Here are 100 photos from the daylong event by redbankgreen. And here’s to a great second century, Fair Haven. The 64th in an annual series, Sunday’s Red Bank Halloween parade featured a barn-and-silo float from Red Bank Charter School plus a mix of reliably scary and fun costumes. redbankgreen was there, natch. Were you? See if we got your picture!